By default Internet Explorer web browser with Pop-Up Blocker support will play a notification sound when pop-up or pop-under windows are blocked and prevented from opening automatically. If you don’t like or not fancy the default sound that IE uses to announce a blocked pop-up, it’s possible to change the sound and assign another different sound for Windows system to play whenever a popup window is suppressed. To change and assign another sound to blocked pop-ups event in both Windows XP and Vista, go to Change System Sounds option in the Hardware And Sound section of Control Panel. In Windows 10, Control Panel may be hidden. Here’s how to open Control Panel in Windows 10. Then, go to Sounds tab. Locate and click on the Blocked Pop-up Window program event under the Windows Explorer or File Explorer heading (Note: Internet Explorer is based on Explorer and thus doesn’t have its own heading in this dialog box). 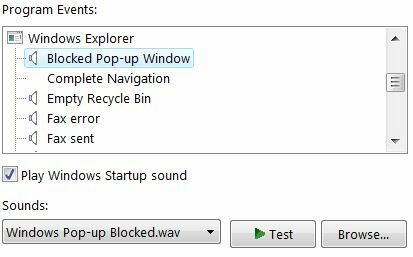 Next, select another sound by choosing from long list of Windows installed sound in the drop down box showing the default “Windows Pop-Up Blocked.wav”. Users can also click on Browse button to select their own custom sound in .wav format. Click OK button when done. You will now hear your favorite tune whenever a pop up or pop under is blocked. The trick works on all versions of Internet Explorer and Windows, including Windows Vista, Windows 7, Windows 8, Windows 8.1 and Windows 10.